The so long awaited day at Portland World Championships with 3 athletes in the competition arrived; Gloria Hooper did not run in the semifinal of 60m. The women shot put podium was decided at hte last throw with the American Michelle Carter with a throw of 20.21m (PB) which allowed her to get the first place. For the second place Anita Marton the last throw was the decisive as well, stripping away the silver medal from the current champion Valerie Adams, 19.33m for the first and 19.25m for the second. The men triple jump saw the victory of the Chinese Bin Dong with a jump of 17.33m, jumped on the fifth attempt as well. Silver medal to the German Max Hess with 17.14m, PB for him, and bronze to the French Benjamin Compaoré with 17.09m. First two best times for the French Pascal Martinot-Lagarde and Dimitri Bascou in 60hs with 7″48 e 7″58, while the third time is from the Jamaican Omar McLeod with 7″58. In the 800m the favourite Mohammed Aman did not find a lucky day and got the fourth place, golden medal to Boris Berian who ran in 1’45″83, silver to Antoine Gakeme (1’46″65) and bronze to Erik Sowinski (1’47″22). Bralon Taplin had a great starting in 400m, he kept the lead until the last 150m when he started feeling the fatigue and he slowed down, he will finish in fourth position; from the behind lines Pavel Maslak started his remount and he confirmed his world champion title for the event with a time of 45″44, Abdelelah Haroun did not manage to catch him and he concluded in second position with 45″59. In the female with 51″45 and with the new continental record, Oluwakemi Adekoya won the title, second and third place to the American Ashley Spencer (51″72) and Quanera Hayes (51″76). Reckless start for the Australian Melissa Duncan in the 1.500m who was surpassed finishing in the sixth position: the Ducth Sifan Hassan reached as first the finish line in 4’04″96. The three following athletes are Ethiopian: Dawit Seyaum, Gudaf Tsegay and Axumawit Embaye. In the 60m Dafne Schippers did not manage to start well and the American Barbara Pierre took advantage to lead the race and concluded in 7″02, while the Dutch finished in 7″04. Third place to Elaine Thompson in 7″06. It was the last event for the combined event who had to deal with the 1.000m: Curtis Beach leads the race and wins in 2’29″04 but it is not enough to grab the podium. 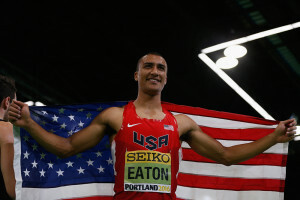 The winner is, for the third time in a row, Ashton Eaton with 6.470 points; two golden medals for the Eatons in this edition of the world competition. Second place goes to Oleksiy Kasyanov with 6.182 points and the third place goes to Mathias Brugger with 6.126 punti.